stains and decals are two different things. 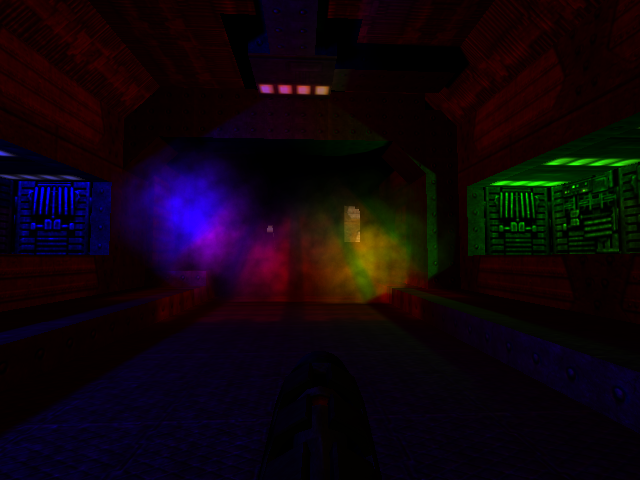 stains are a lightmap hack, while decals are glorified particles. because stains are a lightmap hack, they are naturally not visible any time that the lightmaps are not visible, hence why stains are invisible with rtlights. decals SHOULD be visible with rtlights, but I believe that I broke that recently. This should be fixed by SVN revision 5083.
by default, stains fade over time in fte, but if you set r_stainfadeammount to 0 then they'll no longer fade if you're after that every-wall-is-bloodstained look. I know in dp some sprites can be affectecçd by lights usin a ! in the name of the file. This is possible in not-decals particles? is tooo heavy?? You've probably heard this enough around here, but seriously thank you for FTEQW. It's just a freakin' behemoth of brilliant work. maxdecals controls decal fragments rather than the actual decals, so if you have large decals then they'll clock up much more quickly than you might otherwise expect. Your remark about leaving permanent marks on quake maps makes me want to revisit my in-engine map editor stuff, or possibly just write some ssqc that allows rocket launchers to dig holes. regarding xinput, this is a splitscreen thing. Controllers are only enabled once you hit a button, which avoids USB's random ordering issue. Player 1 then player 2, etc. This also protects against poorly calibrated controllers that might otherwise cause your view to rotate constantly even when the user isn't trying to use them. Note that ANY button should activate it, supposedly, no idea how you're finding its only the right trigger - these are technically not even buttons, but fte simulates two extra buttons so you can bind the triggers to stuff if you want). joystick and in_xinput cvars are separate and distinct, in that they use two different APIs blindly without regard for whether the device is also present in the other api... The earlier API supports stuff that isn't trying to mimic xbox controllers, while xinput is much more precise about what the buttons on the thing actually represents, but as far as I'm aware there's no real way to figure out whether any single device is being reported by both APIs, nor which would be the best to use even if it was. So yes, you probably don't want both enabled at the same time. unfortunately this isn't something that I can really look into myself, as I don't have any kind of controller or joystick. All I can say is that the code should recognise ANY of the 16+2 buttons+triggers. And damn, I didn't even know FTEQW supported splitscreen. Gonna have to test that out extensively soon. And yep, using a button press to assign controllers makes sense, and it does work fine. Me only seeing it with the right trigger was a complicated issue involving how I had the controller mapped through Steam's xinput hook. Can confirm that all axes and buttons map correctly, and analog movement is perfect. Spike, I repeat my question because I had a dream where the particles in fte were affected by the lights Is this possible? technically those are merely lit sprites, but you can get the same result from particles with the same shader. That doesn't make it particuarly fast though. any clue about the shader?? how is possible to add a shader to a particle? via some script? music doesn't seem to work in demos. I type "playdemo demo1", and it plays without music. It works on stages though. Just curious why is that. Would've been cool to make a run button an "unrun" button when always run is on. Quakespasm seems to do that, darkplaces and qte don't. 'playdemo demo1' plays music for me. cl_run 1 with +speed will negate the effect of both. hurrah for q2isms. alternatively just set cl_movespeedkey to 0.5. FTE defaults to settings that are mostly achievable via the menus, so that mods that hack about with various cvar settings will still work properly, but yes cl_movespeedkey set to 0.5 would be a good idea for you. for me, all multimedia keys report an (extended) scan code of 0. this is consistent with eg sdl2. If you wish to try working around it, you can try checking the wParam instead. Really, if you want to handle multimedia keys then you should do it via WM_APPCOMMAND, because then you won't have some other background program changing volume too. also, its fte, not qte. I've no idea where you got that from, but you seem to be repeating it. What FTE stands for, by the way? or possibly just write some ssqc that allows rocket launchers to dig holes. By the way 2, this page FTE QW - QuakeWorld Wiki mentions wiki on fteqw.org, but this site is something unrelated now. What happened to that wiki, is content lost? EDIT: it's on the homepage too now, click "Wiki" at the left. fills the world with stuff, the player can then dig tunnels through it. expect to need cheats, its just incomplete proof-of-concept code and not user-friendly, use at own risk, etc. Wow! Didn't expect you to pull it off this fast! You definitely are a Great Old One... I've never compiled before though (and I don't exactly have the time to dig into it these days), so it may take a while before I try this. Plus, I've read inside the file about some annoying bugs, so I might just wait for a less buggy version. I assume this works only in FTE, right? Would be neat if it was engine independent.